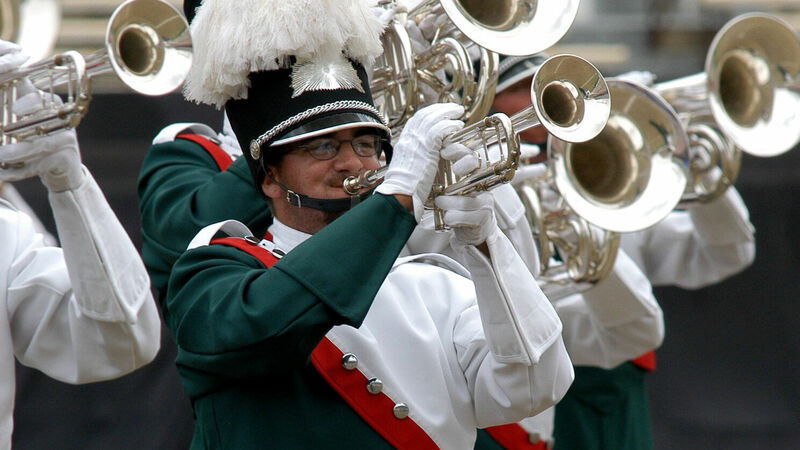 Prior to the 2003 Drum Corps International World Championships, Division II & III class corps competed in their own Finals competition on a day prior to Division I class corps. In an effort to allow more fans to be in town to witness the incredible performances by the Division II & III groups, 2003 marked the first time in history that those corps competed on the final Saturday of the season, taking the field the afternoon before the top-12 Division I corps performed. Division II & III caption awards were spread out among numerous corps in 2003, with no corps having a monopoly on top honors. California’s Esperanza won its first Division II title by taking Brass Performance and Overall General Effect, silver medalist Patriots won the award for Best Color Guard and high Visual Performance, and bronze medalist Spartans took the top Percussion honors. The Division III title went to members of the Blue Stars, who also earned the awards for Overall General Effect, Brass Performance, and Visual Performance. The bronze medalist Marion Glory Cadets were awarded top Percussion honors, and the Best Color Guard award went to the fourth-place Lehigh Valley Knights. In Division II competition, the Massachusetts corps East Coast Jazz finished in fourth place with its production titled, “A Gershwin Concerto.” The show was largely based on selections from Gershwin’s “Piano Concerto in F.” Additional selections from the composer’s “Second Rhapsody” and “Porgy and Bess” were also woven into the production. Famed conductor Walter Damrosch commissioned Gershwin to write “Concerto in F” for the New York Symphony Orchestra (now the New York Philharmonic). This commission came just one day after the famed inaugural performance of “Rhapsody in Blue” at the legendary An Experiment in Modern Music concert, conducted by jazz bandleader Paul Whiteman. East Coast Jazz’s production started with about 90 seconds from the contemplative “Adagio” section of the concerto, performed entirely without color guard equipment. Mostly-blue flags—highlighted by yellow stripes near the poles that duplicated the stripes on the guard costumes—appeared during the vigorous strains of Gershwin’s “Second Rhapsody,” a 1931 work rarely performed in concert halls. Not to be confused with the immensely popular and bluesy “Second Prelude,” this work was expanded from Gershwin’s “Rhapsody in Rivets,” which itself was written for the 1931 romantic comedy film, “Delicious.” Gershwin commented that he thought it was the best thing he had ever written. Next came the lush opening of the “Moderato cantabile” section of the concerto; “cantabile” meaning something performed in a smooth singing style. This segment allowed the mallet keyboard percussion instruments to replicate the piano part from the concerto. Orange flags with gold stripes, similar in design to the earlier blue and yellow flags, came out for the “Allegro agitato” finale movement of the concerto. The mallet keyboards were once again put into heavy use, duplicating the original’s piano part. Concluding the show was two works from Gershwin’s “Porgy and Bess,” the 1935 “folk opera” that is now considered one of the most important American operas of the 20th Century. “It Ain’t Necessarily So” was originally sung by the opera’s character, Sportin’ Life. The corps did a little singing to accent the rhythm of the work, which was visually accented by yellow flags with green and purple stripes near the pole. The show closed with the enthusiastic “Oh Lawd, I’m On My Way,” the finale from the opera. For this week only, you can save on the DVD that contains this complete East Coast Jazz performance, along with all Division II & III finalists from the 2003 DCI World Championship. Buy the 2003 DCI Division II & III World Championship DVD. Discount DVD offer ends Monday, March 7, 2016. Michael Boo was a member of the Cavaliers from 1975-1977. He has covered the drum corps activity for more than 30 years and serves as a staff writer for various Drum Corps International projects. Boo has written for numerous other publications and has published an honors-winning book on the history of figure skating. As an accomplished composer, Boo holds a bachelor's degree in music education and a master's degree in music theory and composition. He resides in Chesterton, Indiana.